This exclusive setting, steps from the ocean and minutes from the Village in Southampton’s estate section, harbors a lush, mature landscape sculpted with fragrant, towering privet and over 440 specimen trees on 43+ acres bordered by meadow and preserve. As one of the country’s premier design-build companies, Kean is creating a vibrant Hampton’s lifestyle with beautifully appointed residences on 4+ acres with private pools, spas, pool houses and tennis courts. Olde Towne was the largest private land holding in the Village and undoubtedly is Southampton’s most prestigious new address. Above and Below: The expansive shingle and stone “Twin Peaks,” set in the heart of the luxury estate community of Olde Town, is an elegant fusion of modern amenities and classic Hampton design. Of the numerous expansive parcels that Kean is building out, two are under construction and a third, “Twin Peaks,” has been completed. Occupying approximately 15,000 square feet, this classic Hamptons beauty is impeccable. Set on shy four level, landscaped acres in the heart of Olde Towne, Twin Peaks, is a pristine country house complete with pool, pool house and tennis court. Three levels of sumptuous details reveal refreshing, modern appointments and state of the art amenities. Kean Development’s award winning construction and design cut a sophisticated, contemporary edge. 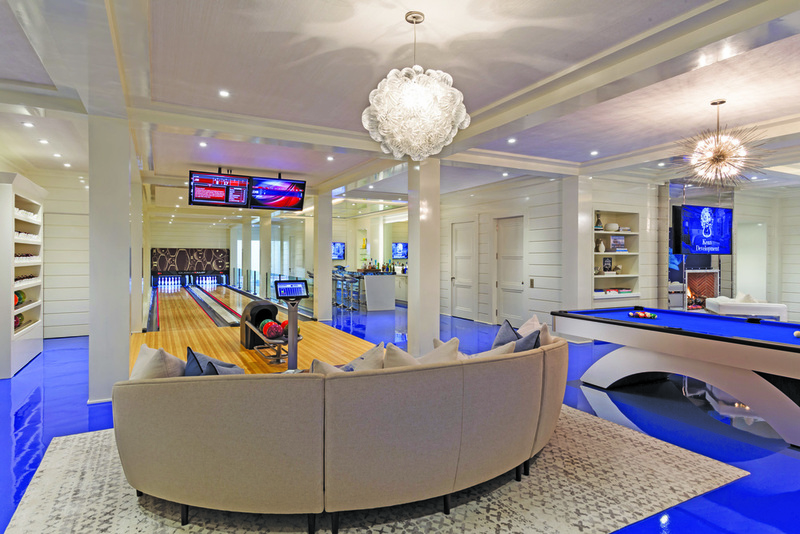 This extraordinary “Smart House” features a Crestron system with intuitive controls that cater to the owner’s every need. Climate, music, doors, shades, screens, fireplaces, pool and spa temperatures, lighting, security and even Karaoke is controlled via I-Pad and cell phone on or off site. Decorated by the celebrated Manhattan firm of Ingrao, Inc., Twin Peaks’ interiors boast an airy, textured, snowy white pallet. Elevations are glossy and mirrored, with superb millwork anchored to floors of white-stained oak. The two-story foyer opens into the living room with gorgeous Lido White bar and fireplace, flowing out onto the expansive loggia through an 18 foot wall of motorized glass doors. The 30 foot loggia has screens that descend from the ceiling at the push of a bottom creating a fabulous, protected alfresco terrace. The main house is comprised of eight full en-suite bedrooms of which two are master suites, nine full and three half baths, the 2nd floor master suite with his and hers baths, three full staircases, elevator, eight fireplaces, full professional stainless steel chef and traditional kitchens, great room, breakfast room, media room, library and loggia with outdoor fireplace. The attached cottage features a full kitchen, living room/dining room and two bedrooms with en suite baths; perfect as a guest or nanny suite. The lower level, accessed by the elevator and all three staircases, is simply amazing. Floored in blue resin, this level has a generous lounge with 75 inch TV and marvelous fireplace set in a polished nickel wall, full blue agate wet bar and back bar; 2-lane professional AMF bowling alley; billiards; gym; sauna; steam room and spa bath with shower; 10-seat theatre; a glass walled, 1,500 bottle stainless steel and mirror clad wine room; two bedrooms with en suite baths; AV room; utility and storage rooms. The pool house features a great room, lounge, kitchenette, two full baths, a bedroom/changing room and outdoor shower. A generous canopy veils the pool house terrace, providing shade for dining and relaxation. The grounds include decorative, automated security gates that open to reveal a manicured, meticulous landscape. The custom swimming pool with a striking negative edge element and oversized spa sit at the edge of the pool house terrace. Submerged sun lounges cool sunbathers in the pool’s novel “beach end.” A convenient BBQ patio, gas fire pit and sunken tennis court, with decorative lattice fencing and a pergola-covered viewing area headline the list of Twin Peak’s outdoor amenities. 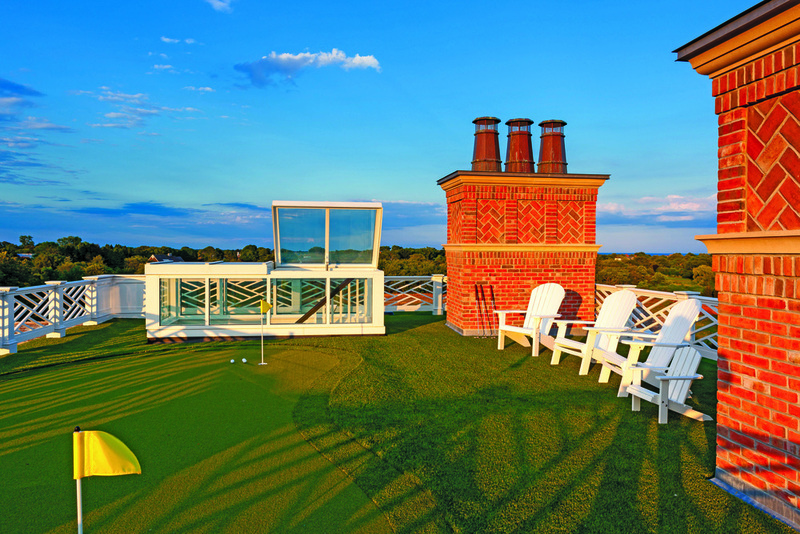 There is ample space for a golf hole to complement the 3-hole rooftop putting green. The verdant, treed periphery maintains privacy as well as “Gold Coast” beauty. Olde Towne is a true, private Hampton’s retreat.